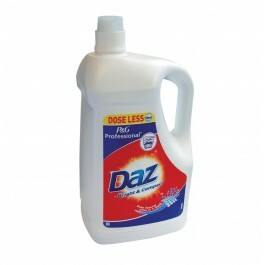 Daz Bright and Compact is more concentrated than ever before, providing 100 washes per bottle. Even at low temperatures there's nowhere for dirt to hide with Daz! Provides deep down cleaning for brilliant whites. The new formulation will even clean clothes from as low as 20°c. Ideal for use in nurseries, schools, laundrettes, for chef whites, industrial laundries and at home. Super concentrated formula - 100 washes per 5ltr bottle. Suitable for pre-treating clothing and stubborn stains. Washes clothes at temperatures between 20-95°c. Dosage instructions as per bottle. Suitable for use at temperatures between 20-95°c.